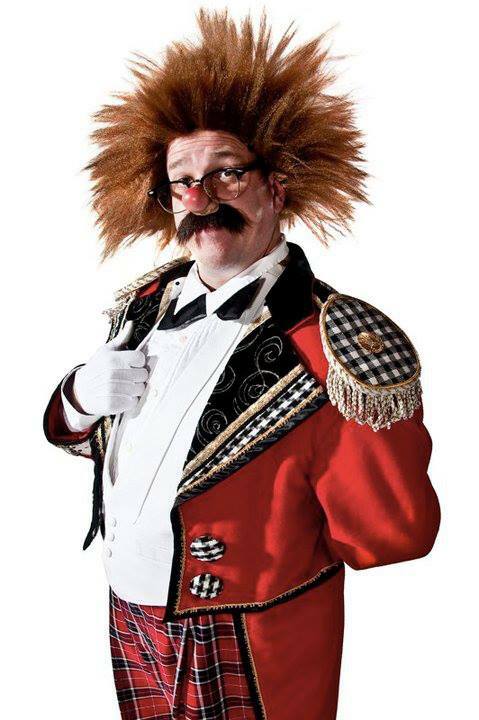 I would argue that Slivers was anything but a "typical" circus clown of that, or any, era. Slivers and Marceline performing their famous boxing act. Alright, Slivers and Marceline were performing this at the Hippodrome in NY. Montgomery and Stone were also performing a Boxing Gag on Broadway about this time. Does anyone know how similar these two gags were and if they bear much, if any, similarity to the Boxing Gag as Poodles Hanneford taught it to Otto Griebling? "Cause every girl's crazy 'bout a sharp dressed man..."
Anyone know who or where this is? I'm lovin' the padded slapstick. 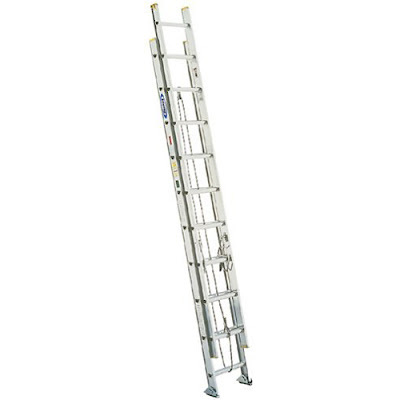 Yesterday afternoon as I drove over the Amboy bridge along the Garden State Parkway I was almost killed as a huge aluminum ladder, not unlike the one pictured above, flew out of the back of a contractor's pickup truck in front of me. It sailed for a ways before hitting the ground and began tumbling end over end. Had I been any closer it would have gone right through my windshield. I was lucky enough to be far enough behind that I had time to change lanes (without looking) before the ladder hit the car. If you are traveling with items in a pickup truck, please be sure to secure them properly. The life you save may be my own. 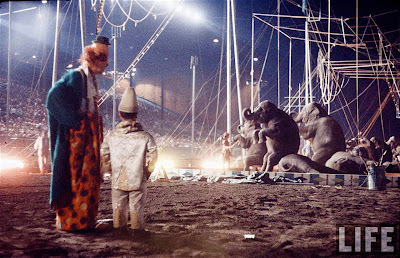 Beautiful photos by Life magazine photographer Ralph Crane taken on an Ringling Bros. and Barnum & Bailey outdoor date in Pomona, CA in 1958. Thank you Dom Yodice for confirming the date! 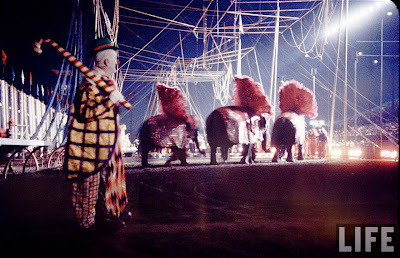 The circus industry: where talent is always recognized and rewarded, innovation is essential and originality is paramount. 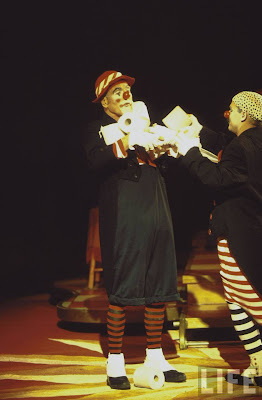 The late Paul Newman performing at the Big Apple Circus with Jeff Gordon. Mostly my old promo video with new shots of the car in the Bridgeport parade. I've been working on updating my website for the last few days. 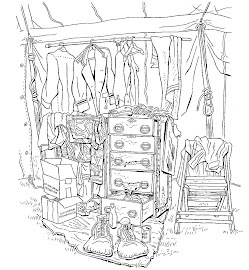 Click the title of this post to check it out. 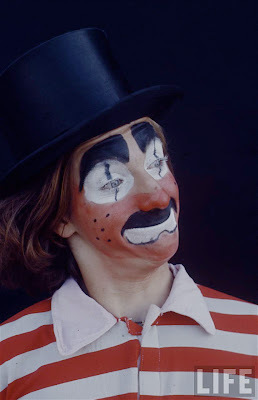 A photo of Johnny Peers taken for the Life magazine article on Clown College that appeared in the February 20, 1970 issue. Emmett Kelly on "What's My Line", an episode that is notable for being the last television appearance of the great Fred Allen who passed away the following week on March 17, 1956. 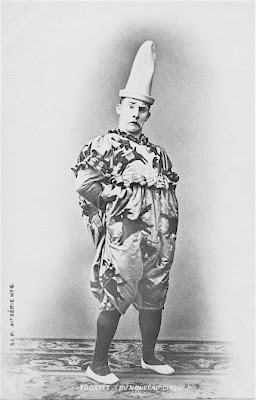 English clown Footit trained as an equestrian acrobat with his father's circus and, by 1880, his appearances with Sanger's Circus established him as a leading horseback clown. 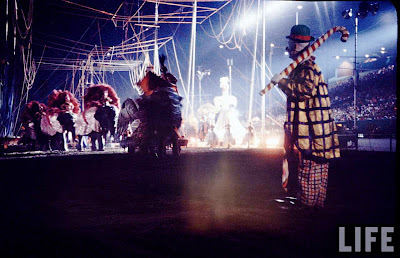 His partnership with Cuban Raphaël Padilla, known as Chocolat (1868-1917), began at the Cirque Médrano in 1886, flourishing throughout the 1890s and early 1900s at the most fashionable Parisian circus, the Noveau Cirque. 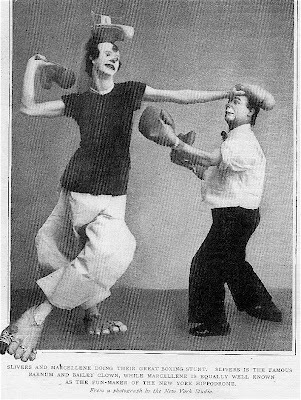 Their slapstick antics, in which Chocolat was the perenial victim of the violent, but impassive Footit, were popular with all levels of society, attracting the attention of many intellectuals and artists. A Photoscenograph film of their sketch William Tell provided the basis for a painted picture band projected at Emile Reynaud's Théâtre Optique in August 1896, while their act was also filmed by the Lumière Cinématographe and for the Phono-Cinéma-Théâtre in 1900. 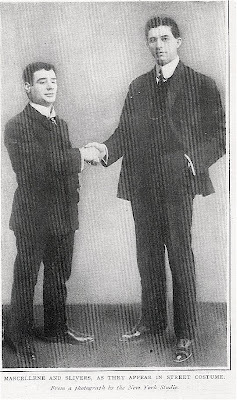 Following the break up of the partnership in the 1900s Footit appeared on the stage and for a brief time ran his own circus. 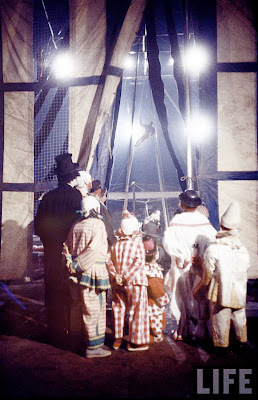 The last five minutes of Charlie Rivel's 1943 film Akrobat Schoon featuring the comedy trapeze act (but not the Chaplin impersonation) that made him famous. You can choose english after the home page. You have there all the program and activities. 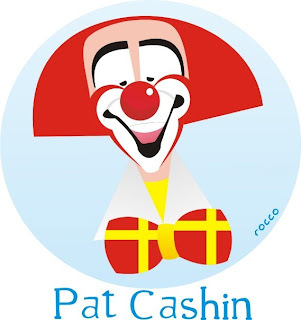 This is the poster for the clown festival in Cornella. 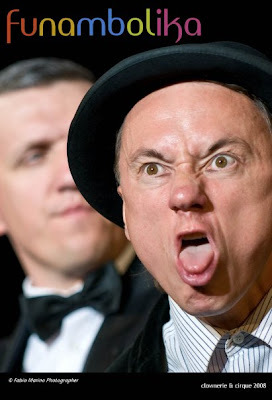 It looks a good program this year: the theatre one-man shows of Peter Shub, mime Daniel and Housch-ma-Housch. 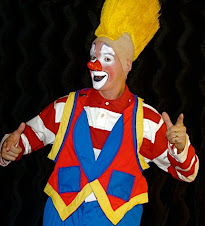 In the big top gala show there are, among others, Jigalov, Chabri and Bello Nock. 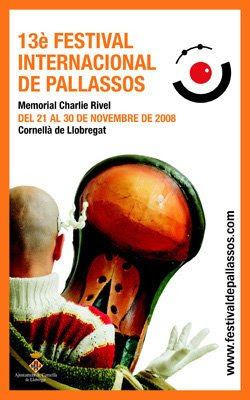 Click the title of this post to be taken to the festival's website. Mr. Stubs, Mr. 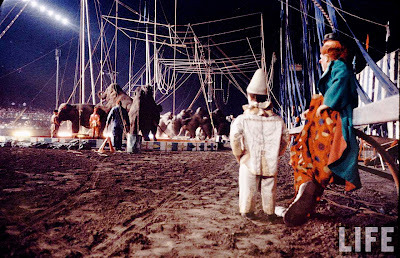 Fish, Oaf and Le Clown Gordoon from the Big Apple Circus' 1987 production 1001 Arabian Nights.